Ask any legitimate foodie in Doha for the city’s must try dining experiences and Brunches would inarguably figure in the top 3 recommendations of every list. However beware these brunches are not like those in the rest of the world to which you usually roll out of bed ! In GCC, these are more like events for which you dress up in your Friday best. They are Grand, Teeming and even sometimes a tad Extravagant. So generally the brunches in the city vary from being a family brunch to the drinkers' brunch to the cuisine-centric brunch to the one with the view and more. 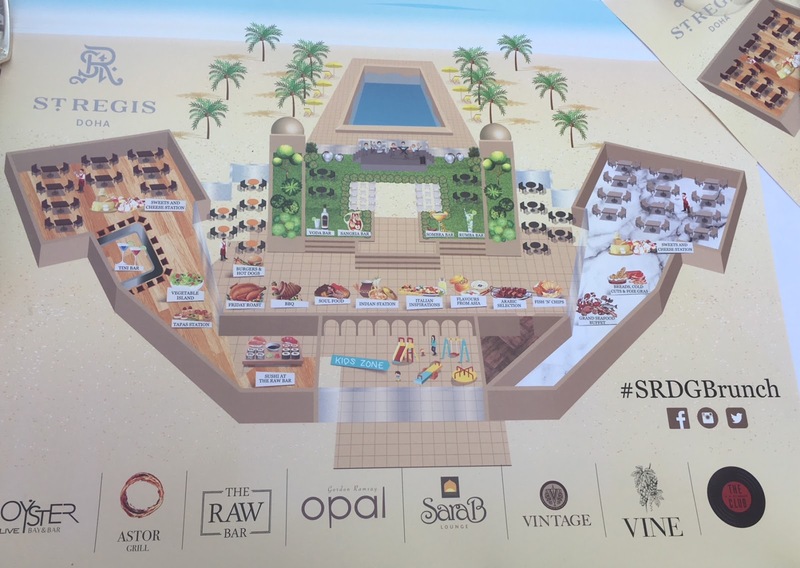 St Regis Grand Brunch can be named as the Brunch with a Map. Comprising of a gargantuan spread and a countless number of dishes and stations, you would genuinely be "lost" without a map. The buffet ranges around an area of 2500 sqm and is made up of 16 stations including live cooking and dishes from the hotel's flagship restaurants such as Opal by Gordon Ramsay, the Raw Bar, Astor Grill, Vine, Sultan Ibrahim. Dishes offered vary from Sushi to Shawarma to Fish and Chips to Beef Wellington to Pizza to Foie Gras to Burgers to Indian to Pot Roasts to Tapas and much more. I really was not joking when I called it “gargantuan”. And as if that was not enough, you could also grab your drinks from the live cocktail stations ranging from sangria to mojitos to margaritas to martinis. For those with uncontrollable overzealous kids like ours,St Regis offers the perfect antidote in the form of a supervised play area with a jumping castle, face painting and other activities equipped with a special kids' buffet. I was a happy mommy cruising through the buffet and yet being able to see my deeply engrossed little one through the corner of my eye. The brunch patrons included groups of families, friends, all girls to all boys, all who seemed to be glad to be outside after being confined to the indoors for too long. AFGHANISTAN; for a country that has been in the limelight in recent years for majorly the wrong reasons, it is a sad fact that its cuisine also has not garnered as much prominence as that of many of its neighboring countries. As mentioned in my earlier post, I embarked on an A-Z Global Cuisine Project and chose AFGHANISTAN for A. During my research, I happily discovered that Afghani cuisine is a powerhouse of flavours and best described as hearty comfort food. The cuisine of this landlocked country has been deeply influenced from that of its neighbours namely Pakistan, Iran, China, Turkmenistan, Uzbekistan and Tajikistan. Afghani cuisine can neither be described as hot nor spicy and rather flavourful. Chief crops of the country are rice, pomegranate, nuts, dry fruits which obviously makes way into their cuisine. An Afghan traditional banquet is generally served on the floor with the dishes spread over a Dasterkhawan (Tablecloth). Afghani hospitality is regarded to be one of the best in the world. Guests are considered like kings and hosts prepare elaborate meals using special ingredients even perhaps by using up their savings or inspite of the fact that they have not had meat themselves for months together. To kick off my project (which I have talked about here), I prepared the “KABELI or QABILI PULAO” which is the National dish of Afghanistan. A few months back, I happened to read this book-Life from Scratch by a food blogger, Sasha Martin. The book revolved around the mammoth project undertaken by Sasha which involved her cooking from every country of the world i.e. precisely 197 countries. Tackling one country per week, it took her almost 4 years to complete this assignment. She initially commenced this major task with the prime objectives of coaxing her picky husband to experiment with food and exposing her six-month daughter to various global cuisines. But as she delved deeper into herself, Sasha realized this project was her way of meditation and making peace with her extremely difficult childhood. Sasha was raised by a single mother and they faced serious financial difficulties. However, her mother was a very savvy cook and let no crumb go to waste be it moldy breads or spoilt apples. What she didn't have in resources, she made up for in creativity such as by introducing cranberry juice with cereal just because she could not afford milk. Cooking and food was Sasha's strongest connection to her mother which kept her going when she lived in a string of foster homes. Sasha in her book, particularly talks about certain recipes such as the German Tree Cake recipe which consisted of 21 layers made from almond paste that had to be further broiled, layered and frosted. This was a recipe that her mom had saved up for months and took them jointly two days to make. It was her mother's way of teaching Sasha that life is all about resilience and perseverance. Perhaps cooking her way through 197 countries was the adult version of the German Tree cake recipe through which Sasha managed to make peace with her past, forgive and move on to find happiness in her current life. Lately there have been several round-ups of Ladies' nights happening across town with fabulous offers of free drinks, complimentary bites and drinks priced as low as QR 5 ! It was not long enough before the Hubby (over)reacted on hearing about these and stated-"What makes you ladies so special and privileged that only you all deserve these?" Men are clearly not the ones bogged down with the feeling of constant guilt for leaving the families behind at home on their one night off perhaps after a year or even a decade ! Men are most certainly not the ones worried about being the perfect wife, perfect mother, perfect daughter, perfect employee, perfect boss, perfect chef, perfect housekeeper, perfect friend or definitely not the insane being for even hoping to strike a perfect balance between all of the above roles. Even scientific statistics evidence that women were 1.9 times as likely as to suffer as men from anxiety disorders primarily due to juggling work and family life. So yes Dear Hubby, ladies definitely do need bonus nights and value deals to coax them to get out of the house for "fun". Around the same time, Hilton Doha invited me to their Wednesday Ladies' Night at Trader Vic's. So, I called up a friend from my university days based in Doha who I hadn't met in over a year inspite of us living 10 minutes apart, gave an ultimatum to meet and soon enough we headed off to Trader Vic's. 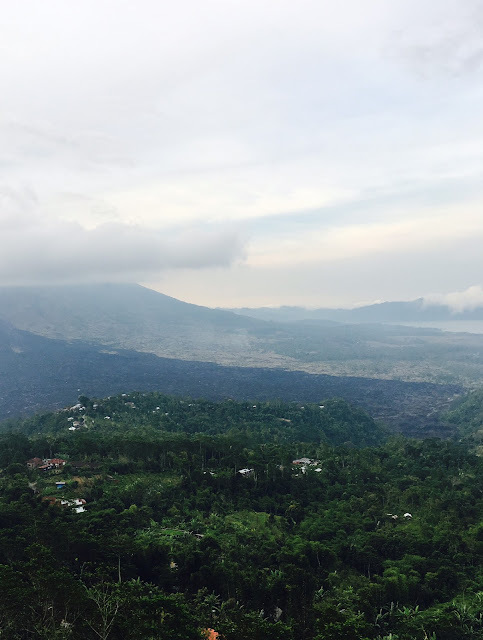 9 FUN THINGS WE DID IN BALI! If I have managed to convince you to head to Bali with my previous post, then below are what you could actually do once you are there. Wherever I travel, I try and register myself for a local cooking class as this not only gives you an excellent insight into the actual local culture and real cuisine but also you always end up meeting an wonderful group of people from across the world. We attended the Lobong Culinary Experience in Ubud which offered a pick/drop facility, a market tour , an insight into the Balinese joint family system and ofcourse, the actual class held in their family compound. We jointly cooked every dish from scratch which went on to enjoy them for lunch. 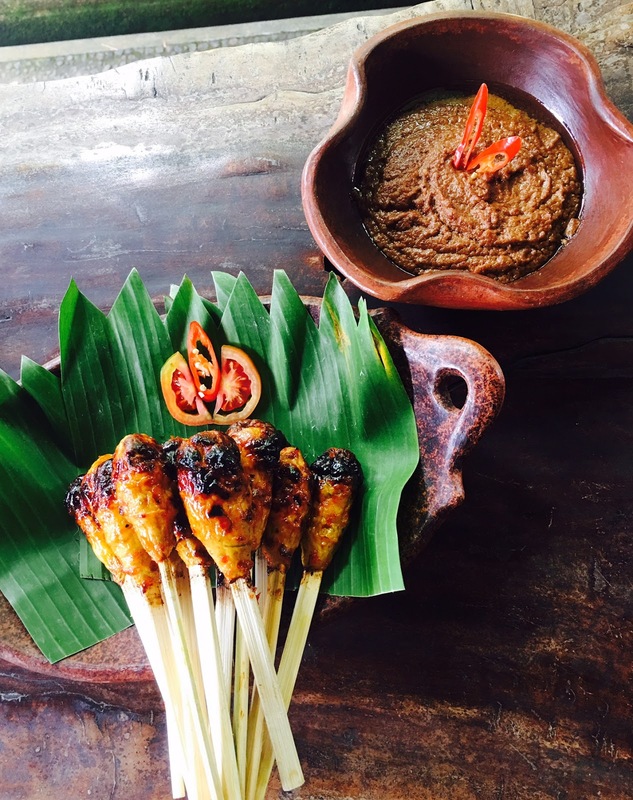 My favourite was the juicy chicken satay served with finger licking peanut sauce. 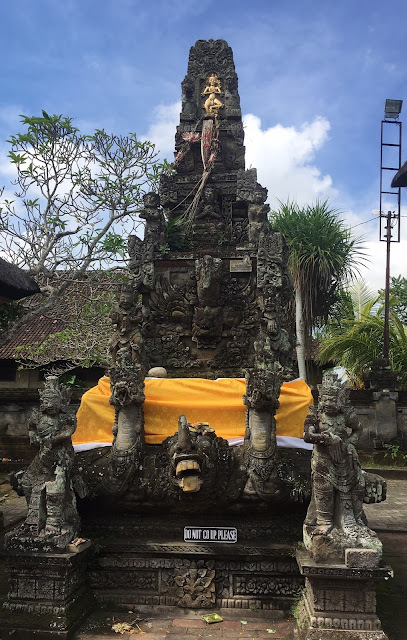 Most major tourist attractions in Bali are temples (Puras) ranging from those on mountains (Besakih-mother temple), in caves (Goa Gajah), along lakes (Ulun Danu Beratan) to along the coast line (Tanah Lot and Uluwatu). Other famous sights/tours are the terraced rice paddy fields, sunrise trek to mountain tops or waterparks especially if you would be travelling with kids. 9 REASONS ON WHY YOU SHOULD GO TO BALI ? I was bitten by the travel bug quite late in life kicking off with our trip to Italy in 2015 and then last year I even went on my first solo trip to Thailand. This year, it continued with my first girls' trip to Bali,Indonesia. 1.Bali offers something just about for everyone and is ideal for honeymooners, friends, families, retired couples and even for solo travel. You would end up being spoilt when it comes to choices for accommodation ranging from homestays, budget to midrange hotels to luxurious resorts. 2.There's nothing more appealing than zero visa hassles considering Bali offers free 30 day visas on arrival for citizens of almost 140 countries making it one of the few countries (for atleast Indians), that you can plan spontaneous trips to. 3.You are almost always surrounded by lush greenery, azure blue seas and by tourists. And since everyone is on a holiday, you are amongst such positive and relaxing vibes that you will also end up being the less wound-up version of yourself. After a longer than intended hiatus from this space of mine, I was more than eager to return. 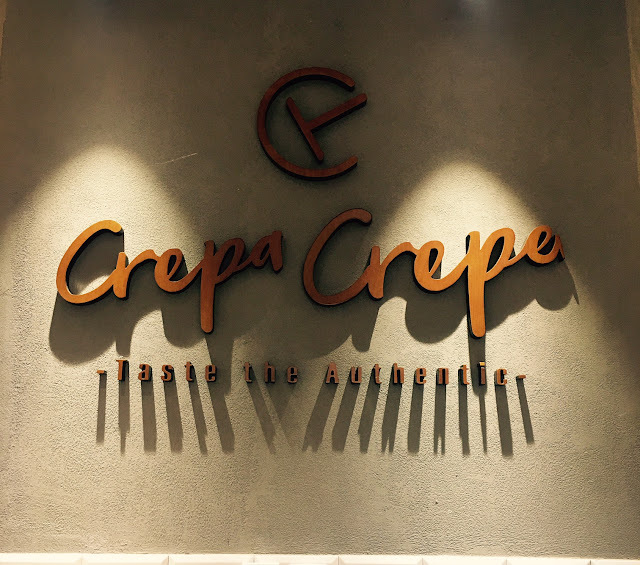 It only seemed coincidental that as I was scouting for some material that an opportunity presented itself in the form of a invite to a newly opened "Creperie" located in the Pearl Qatar. 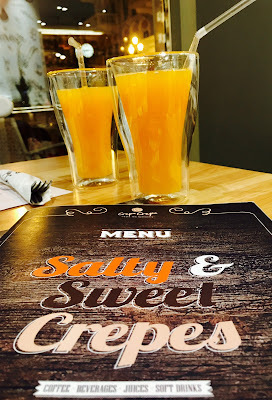 Hubby being a major crepe lover and a chance to sneak away for a date night was infact icing on the crepe ( Oops cake) ! 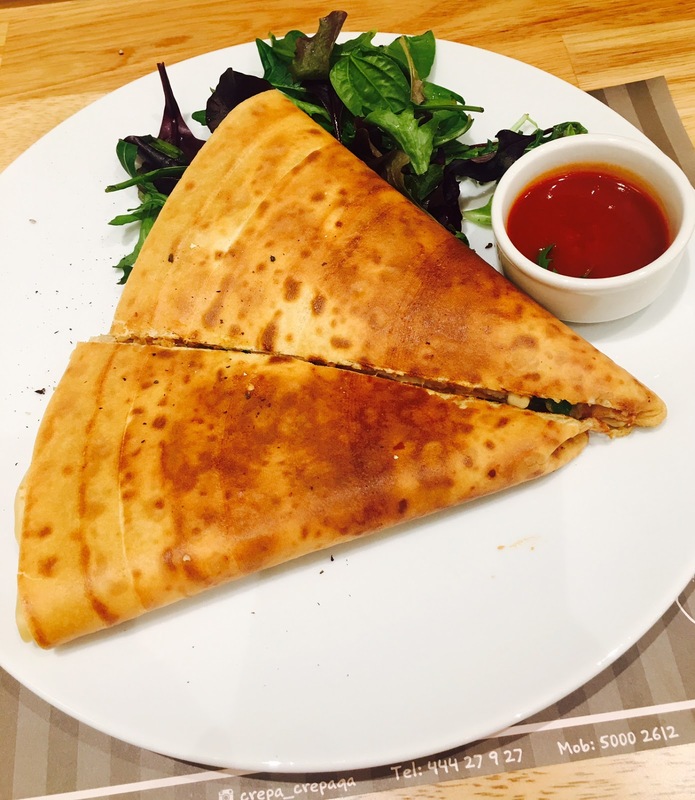 Crepa Crepa is tucked away in the charming Qanat Quartier district in the Pearl which now houses several new eateries namely The Breakfast Club, Esmer Chef, Waffles and Coffee. The restaurant painted a pretty picture with both outdoor and indoor seating facing the cobbled streets and quaint street lamps. Infact it is not too difficult to imagine that we were not in Doha but vacationing at a road-side cafe somewhere in Europe. I also thought the interiors were done very thoughtfully which gave the whole place a very cozy feel that could be best described as that you were actually sitting in a friend's dining room than at a restaurant. Service was perfect although it is fair to mention that they were expecting us. What I specially thought was noteworthy was that the owner, a Qatari national not just introduced himelf but also took out the time by very passionately taking us through the concept and the highlights of the menu. He also explained that Crepa Crepa is an international franchise hailing from Greece and their Qatari venture is their 16th outlet worldwide. Once we glanced through the extensive menus offering more than 20 varieties each of the savoury and sweet crepes with additional options to also create customized crepes,left us only further undecided. Finally with the help of our server, we managed to narrow down our choices to two appetizers and two mains. The Appetizer Bites were basically crepes that were rolled and sliced up served with a dipping sauce. 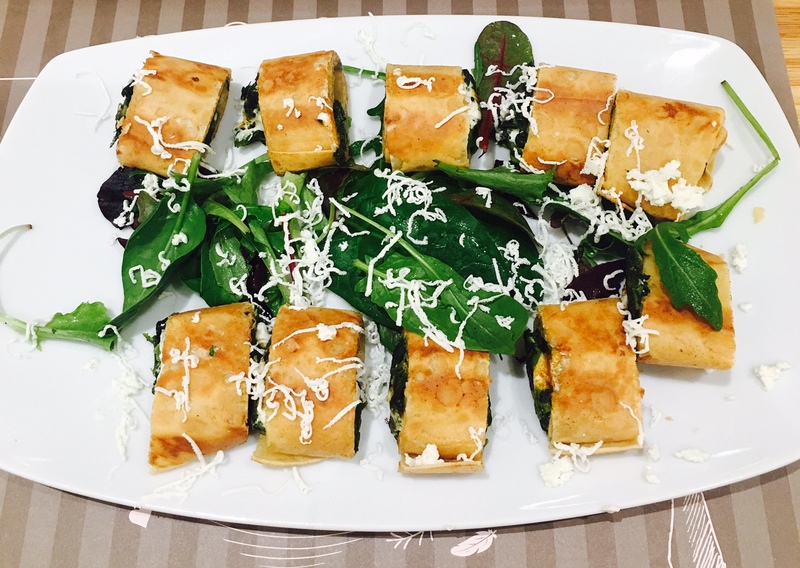 We had chosen the traditional Greek Tasty Spinach and Smoked Salmon. The Tasty Spinach had a filling of spinach,onions and dill that was complimented with a nice tanginess from the feta and served with a mustard sauce. Smoked Salmon also contained a filling of spinach, onions, dill however with a base of creamy Philadelphia cheese and ofcourse smoked salmon which was served with sour cream. Had to rely on the hubby to do the scoring for this round given that I am not a fish-eater. His favourite was the Smoked Salmon which he described to be fresh and clean. We both thought that the Tasty Spinach could be served with a different sauce (probably a sweet chili or a spicier sauce) considering that both Feta and Mustard were tangy in nature. For the mains, we had chosen the Mexican and BBQ Texas crepes. Again initially had to rely on the hubby since the Mexican contained beef which I am not a fan of. ( And you think why Am I a food blogger ?) After some gentle coaxing by the hubby, I took a bite and I was completely blown away. That one bite contained flavours of the spicy minced beef, creamy guacamole , crunchy peppers describing which makes me salivate now. I ended up polishing half of this crepe and why only half if you may ask is because I had to give up the other half as part of my "wifely love" which as an afterthought now I think was foolish ! The second crepe- BBQ Texas was nothing to write home about but delivered in terms of its flavours with smoked turkey, mushrooms, peppers, gouda cheese and BBQ sauce. What also I must highlight about both these crepes were its perfect crispy thin texture that put some of others that we have had in the past to shame. 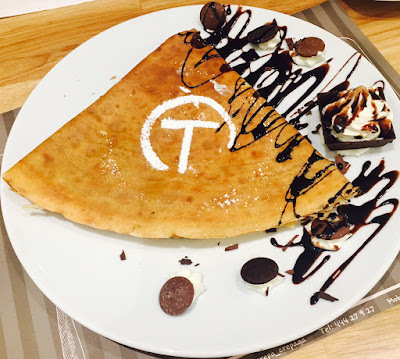 It goes without saying that all crepes are made to order and at a live cooking station. For desserts we had the Cheesecake Selections with strawberry jam and the Extreme Chocolate with an addition of bananas. The Strawberry Cheesecake was a disappointment and tasted nothing like a cheesecake rather than just a strawberry jam interspersed with some cream cheese. 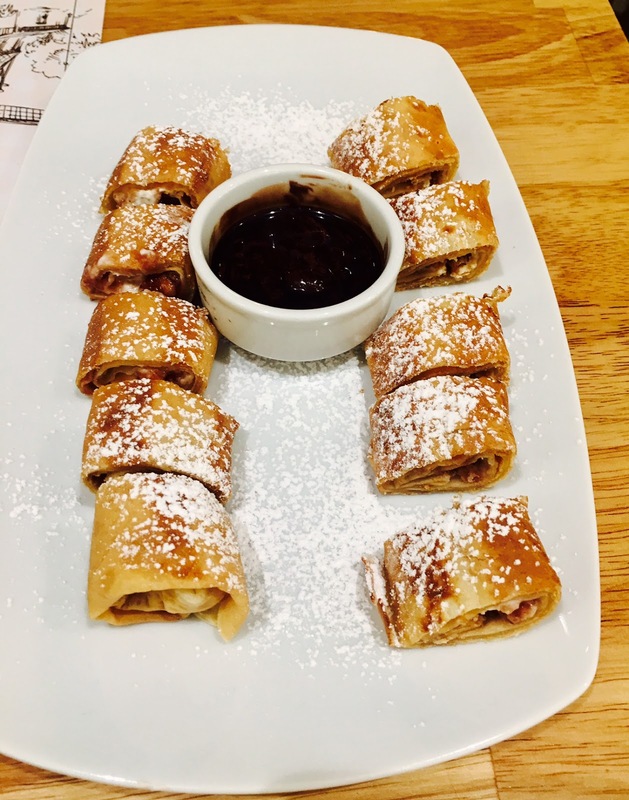 Extreme chocolate hit the right spots for a dessert with its rich tastes of white, milk, dark chocolate, banana and nutella. Served with whipped cream, I thought we should have ordered a scoop of vanilla ice cream on the side. For a place that technically serves just one dish, this restaurant does a splendid job in bringing countless varieties to your plate that makes you even forget the intrinsic similarity. 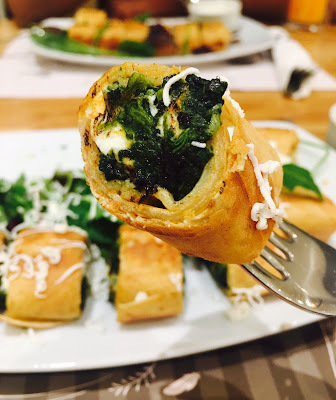 If you are looking to spend a relaxed time on a date or with friends and family in a serene ambience with fresh and delicious food, look no further and head to Crepa Crepa.